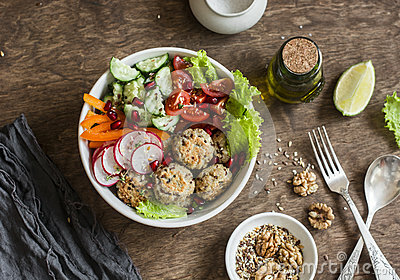 Stock image of baked quinoa meatballs and vegetable salad on a wooden table, top view. buddha bowl. healthy, diet, vegetarian food concept. stock image of Salad with quinoa, peeled tomatoes, roasted peppers, grated egg, cheese and dressing. stock image of Several kinds of Italian regional bread on sale. stock image of Quinoa crusted fish on asparagus on yellow plate.